“No way, an olive farm?” I shouted at my computer. 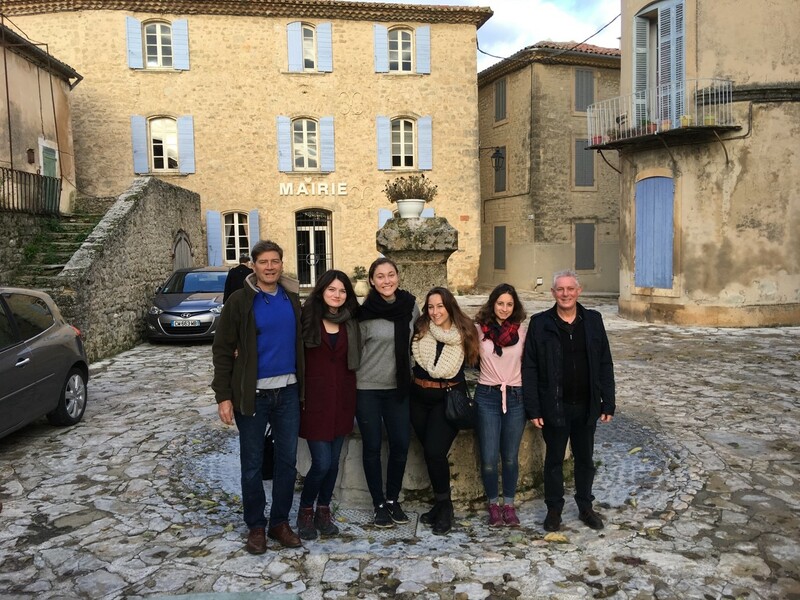 An email had just popped up, with an invitation to the Seale family’s olive farm in Provence, a green and rocky and lavender filled part of southern France.The invitation was for the harvest weekend, complete with a Thanksgiving dinner. I immediately replied, “Yes, please!” A month later, I arrived at the farm with three other Californians: Monica, Sophia, and Isabelle. As soon as we got to the farm, we went with the family on a tour of the fields. After being in a city for so long, it felt incredible to breathe in the crisp air that whooshed through the rows and rows of olive trees that surrounded us. At the end of the tour, we ended up in a clearing overlooking the valley below us. The setting sun threw bright orange light over the rough mountains in the distance and tinged the foliage in the valley golden. We stared at the scene, and mimicked The Lion King scene where Simba is presented to the world, since both were equally majestic. We could not wait to harvest the olives! The next day, we woke up early to harvest olives. We ate slices of fresh baguettes and spread them with honey from the farm, and homemade preserves. Best of all was the apple butter that lured us with its sweet and smooth flavor. The family of olive harvesting experts taught us how to lay out the long nets down the rows of olives so we could pick the olives and let them drop into the nets. We then each took rakes to comb the branches for olives. The supple branches merely bent, and olives readily fell to the nets. While we worked, we talked with each other and learned the ins and outs of the olive harvest. For example, olives are hard when you pick them, and they must be soaked in brine for a month before you can eat them. However, the Seale’s olive oil leaves a taste of pepper and apple in the back of your throat. This is because you can press olives the day that they are picked to make oil, so that they do not lose flavor. At lunch time, we stopped for Thanksgiving dinner. We sat at a table of 22 of the Seale’s family and friends, and spoke English and French with our table mates. For us four Californians, who have been away from home for months, the stuffing and turkey and cranberry sauce gave a delicious flavor of home. For dessert, we had the king of the meal: a fruit cake that Sophie had soaked in liquor to keep moist. After lunch, we slowly recovered from our food comas. We finished off the day with soup by a bonfire. Sunday, we were up early for the harvest. This time, we worked with a professional team of olive harvesters. We had to move faster, and be careful to not get in the way. For dinner, we ate the most delicious tartiflette. That night, we had champagne around the fireplace, and Zoe taught us how to build a proper fire. We talked with the Seales and felt at ease, sleepy and warm from the fire. The next morning, we left early for the train station, and on our way stopped by the Mayor’s office of Grambois. We met him and walked around the town. The town was perched on a hilltop, with stone houses with bright blue doors and flowers crawling up the walls and over the sidewalks. At the end, we decided to buy a house in Grambois in six years, and shook on the deal. Thank you to the Seale’s for this wonderful experience and thank you for showing us our future town!